RoofBag Car Top Carrier Installation | Install Car Carriers for Cars With Rack and Without Roof Rack. Front of carrier should be set-back at least 8 inches behind front edge of roof. Notice correct (top 4 pictures) and incorrect (bottom 6 pictures) strap angles. Note: for the Straps with Door Hooks to work, car must have 1/2"-wide ridge inside door frame similar to shown. 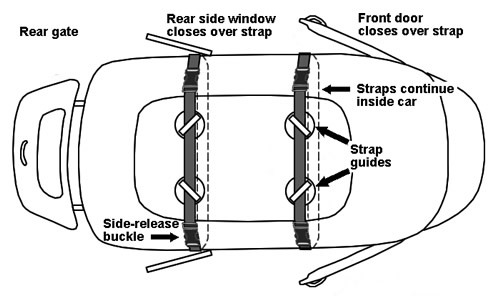 If car does not have this ridge, use the Inside Straps that come with the carrier instead. Note: for large vans, straps may need to be double-length. Order an extra set of Pass-Through Straps and connect them end-to-end as needed to make double-length straps. Note: for large vans, straps may need to be double-length. Order an extra set of Pass-Through Straps and connect them end-to-end to make double-length straps. Note: straps may need to be double-length. Order an extra set of Pass-Through Straps in addition to the set that comes with the carrier, and connect them end-to-end to make double-length straps. Place the carrier on a clean roof and (optionally) on a Protective Mat with the side without zipper facing the front of the car, and the logo facing the back of the car. Place the front of the carrier at least 8 inches behind the front edge of the roof, to minimize wind noise and improve gas mileage. Open the zipper and fill the carrier while on top of the car -- it may get too heavy to lift once it's full. Fill the carrier as full as possible. A fuller bag provides a smoother ride. Place more items toward the rear to preserve the bag's wedge shape. Cushion hard or sharp objects to avoid fabric damage. Close the zipper completely until the two zipper pullers meet at the back. Make sure you leave no open gap between the zipper pullers or rain may enter your carrier. Fasten the straps as described below and then adjust the length by pulling the free ends of the straps. Straps should be snug but not over-tight. Tuck the free ends under the straps, to avoid strap flapping. Follow the specific instructions below and the corresponding diagrams for your situation. See the Strap Angles diagram sheet for correct strap orientation. Straps are labeled on their packages. A) CARS WITH ROOF RACK (Each strap has 3 parts: 1 Top Strap, 1 Rack Short Strap, 1 Rack Long Strap). The rooftop carrier may sit between or rest over the side rails or crossbars of the rack. The carrier is flexible and will adapt to the space available. Slide a Top Strap under 2 strap guides located at the top of the carrier. 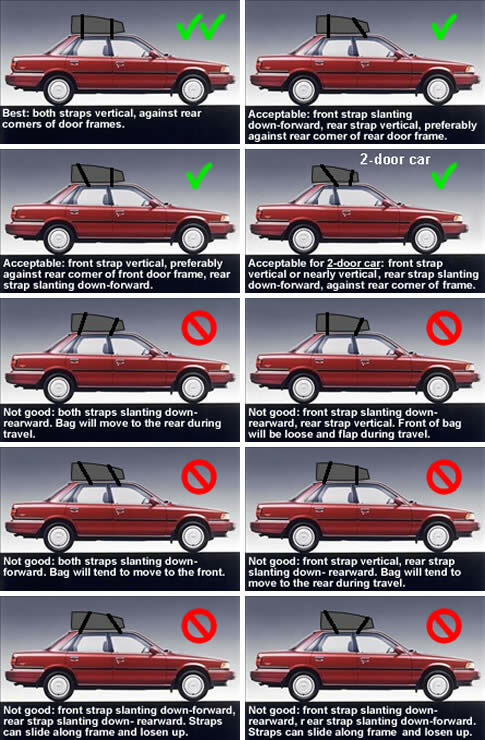 Top Straps should go left-to-right for side rails and front-to-back for crossbars. Attach the Rack Short Strap and the Rack Long Strap to the side rails or the crossbars, threading each buckle through the loop located on the opposite end of each strap. Slide the half buckles of the Rack Straps into the half buckles of the Top Strap until they click. Repeat for the other strap. 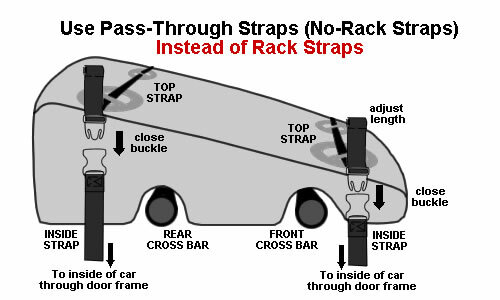 If the car is equipped with side rails and crossbars, a second pair of straps can be installed at right angles to the first pair, passing under the same 4 strap guides. B) CARS WITHOUT RACK Using Pass-through Straps (Each strap has 2 parts: 1 Top Strap, 1 Inside Strap). Slide a Top Strap left-to-right under the 2 front strap guides located at the top of the carrier. 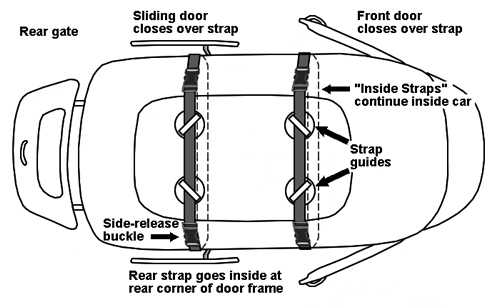 Open the front doors of the car and run the Inside Strap across the interior. Slide the half buckles of the Inside Strap into the half buckles of the Top Strap until they click. Repeat for rear doors on a 4-door car. 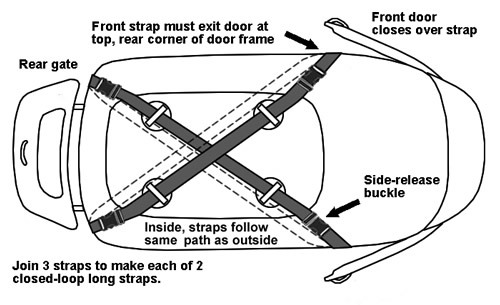 On a 2-door car, separate the 2 Inside Straps as much as possible. Straps should not interfere with the closing of the doors. C) CARS WITHOUT RACK Using Door Hooks (Each strap has 3 parts: 1 Top Strap, 1 Hook Short Strap, 1 Hook Long Strap). Slide a Top Strap left-to-right under the 2 front strap guides located at the top of the carrier. 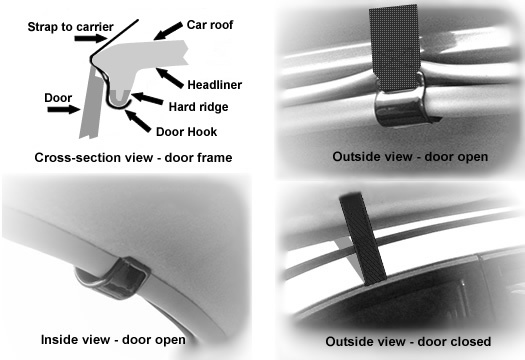 Open the cars doors and attach the strap hooks onto a hard ridge or lip approximately wide by high, sticking down from the top of the door frame. The ridge may be covered with a plastic molding or rubber seal. TEST: The hook should stay firmly in place when pulling upward on the strap. Close the door over the strap. The strap should exit between the door and the frame, and the hook should be invisible from the outside. Slide the half buckles of the Hook Straps into the half buckles of the Top Strap until they click. Repeat for the rear straps. NOTE: If your car does not have the required ridge, use Inside Straps instead. 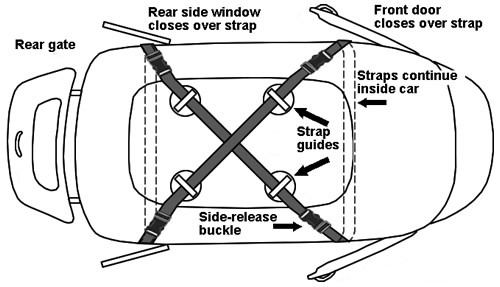 STRAP GUIDES - The 4 strap guides at the top of the cartop carrier are intended to serve as a guide for the straps. Do not tie the straps or anything to the strap guides. FILL THE CARRIER - Use the cartop carrier full or almost full whenever possible to avoid fabric delamination caused by wind flapping. LOOSE CREASES - When strapping the carrier, avoid leaving loose creases in the fabric, as they tend to flap in the wind, causing noise, lowering gas mileage and damaging the fabric (delamination). Use extra straps if necessary to hold down any loose creases. FIRM ATTACHMENT - Check the firmness of the straps during travel. Don't attach the straps to a rain gutter, to a corner or edge visible from the outside of the car when doors are closed, to open hooks, or to anything not intended to support heavy loads. AVOIDING WATER ENTRY INTO THE CAR - Over-tight straps may deform the door seal in some cars and allow rainwater into the car. Loosen straps slightly while driving through rain, or when leaving car unattended when rain is likely. 1- Logo should point to the back of the car. 2- Close the zipper sliders until they touch. 3- Use the carrier full or almost full whenever possible. 4- If the carrier is not full, make sure the zipper flap is vertical all around. 5- If you wash an empty car top carrier with a water hose, you may get water into the carrier through the zipper even if the zipper is closed. The buyer is responsible for installing the RoofBag carrier securely. An improperly secured carrier can fall off the car, potentially injuring others or damaging the carrier, your belongings or other vehicles. Any damage to the carrier caused by detachment from the car is not covered by our warranty. In addition, the manufacturer is not liable for any loss or damage caused by the carrier, or for any indirect, incidental or consequential damages resulting from the use or the fall of a RoofBag carrier, whether the carrier was defective or not. The manufacturer's liability is limited to the repair or replacement of a defective carrier according to the warranty terms described at www.RoofBag.com. If you need installation assistance, please call 800-276-6322 (800-2-ROOFBAG). A 30-day return policy applies to unused car top carriers. A 2-year repair/replacement warranty covers: fabric puncture or tear, fabric and seam waterproofness, failure of straps, buckles and other hardware, seam separation, zipper operation and integrity, and separation of welded components. Not covered: damage caused by falls, accidents, improper installation, natural wear and tear, or failure of the car's components used to attach the carrier to the car. More details in Warranty and Returns page. For more details see Warranty & Returns page.